Hot Toys shows off their newest Age of Ultron figure. What do you think? 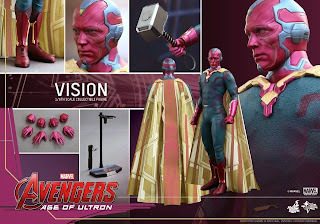 Full pictures for Vision have been released I can see why they waited till after the movie release to show it off. 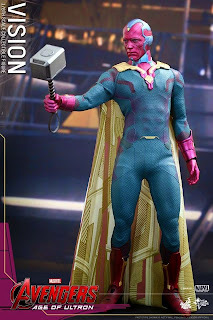 The spoiler accessory I think is the perfect addition to the release. There are not many accessories I can think of but this one is a must. The sculpt I personally think is great, I can definitely see Paul Bettany there. I have been pretty happy with the quality of the Aou figures so far, I think the line up will look great together. 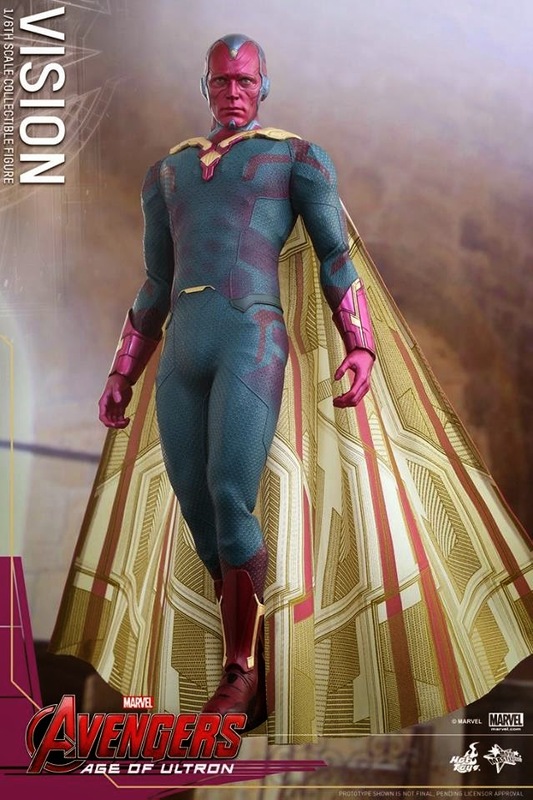 It looks like the suit and body are in the vein of the Man of Steel release which came out great. 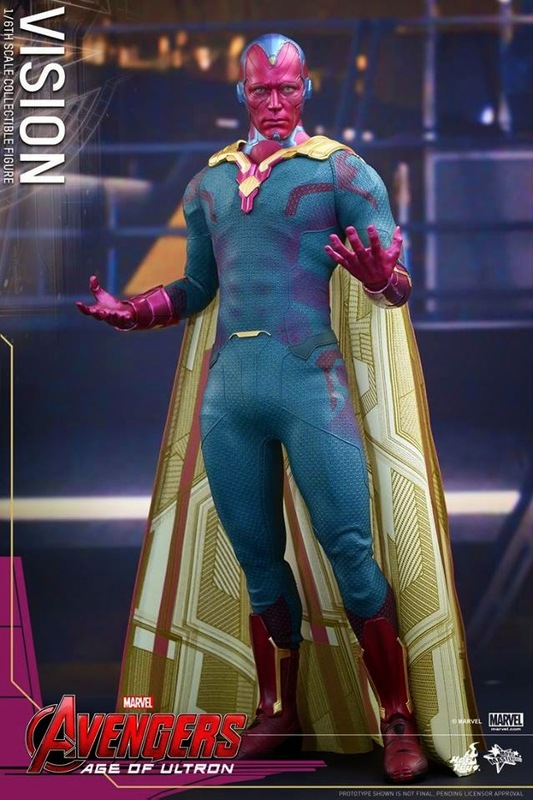 I don't think you will need to worry about this suit over time. The Cape looks great but I do hope it appears more silk like in hand. In the movie itself it appeared very silky to me and the paternity was not as defined. That would be my one gripe with it right now but it is not a deal breaker by any means. So what do you guys think? Are you happy with how the proto turned out? Will you be adding it to your collection? 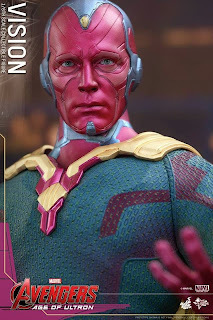 Personally I was a big fan of Vision in the movie and it looks like Hot Toys did it justice. Loved the way they did him for the movie, although I really wish I had gone in not knowing he was even going to be in it. That reveal would have been EPIC. This release was one of those pre-order the moment it was shown. 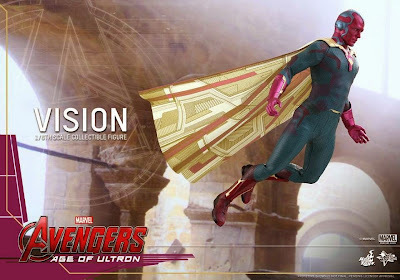 Can't wait to add him to my shelf. And I definitely agree about the cape. It had an extremely light and buoyant look in the film and I hope they go with something like silk for the figure.